OTTAWA -- Statistics Canada says the country's economy returned to growth in October, although at a sluggish pace. 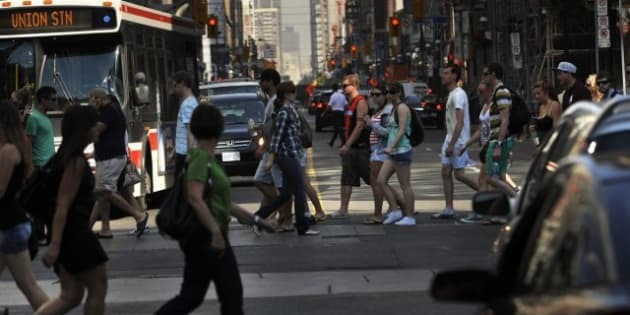 The 0.1 per cent advance follows a flat reading in September and a 0.1 per cent contraction in August that had contributed to Canada's worst quarter of economic growth in over a year. The October performance, which was in line with economist estimates, starts the fourth quarter off on a welcome positive note. The agency says the major contributors during the month were wholesale trade, which rose 0.8 per cent from the previous month, and retail trade, which increased 0.3 per cent. Oil and gas extraction increased by 0.4 per cent, and utilities advanced by 1.2 per cent. But there was also continuing weakness in manufacturing, down 0.4 per cent; mining, also 0.4 per cent lower; construction, down 0.1 per cent; and real estate agents and brokers, which registered a 1.4 per cent decline. Overall, the goods producing industries were flat in October, while the services sector gained 0.1 per cent. From a year ago, the goods industries remained in negative territory, down 0.1 per cent, while services contributed 1.7 per cent to economic growth.